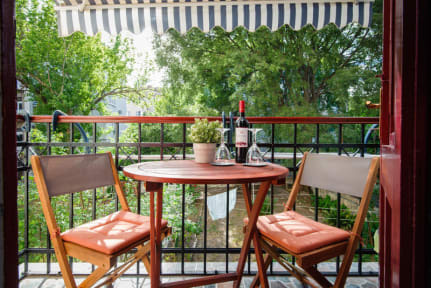 Private Accommodation Milisa is located in the centre of town. Accommodation have one triple bedroom, one double bedroom, and one with two separated bed. Each room has air-conditioning, fridge and cable TV, guest have free Wi-fi Towels and sheet are included in the price. One of the room has a small balcony. Within the guesthouse there are 2 separate bathrooms. Guesthouse is close to all contents that our town Split offer in the summer. Guesthouse is located 5 minutes walk from old town where is placed UNESCO World Heritage Site Diocletian Palace. 10minutes away from Guesthouse there are main bus,train stations and city port which connects city with famous Croatian islands. It allows you too easily organised your day and visit some of our famous islands. But If you decided to stay all the time in Split,the famous sandy beach Bačvice is on 15 minutes walk away. In the evening, this beach turns into the center of the Split's nightlife. In the nearby of guesthouse, there are numerous restaurants and bars, as well as the bank and internet caffe, and the grocery shop is in front of the entrance. 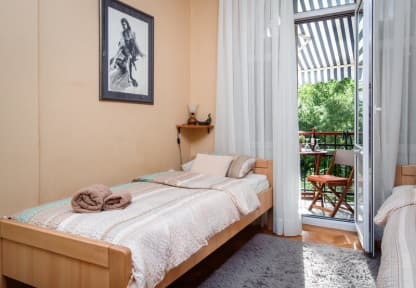 New and modern decorated Apartment Milisa is located in street Lučićeva 6, it has two fully equipped room , and it can accommodate four people. Apartment have one double room and another room with two separated bed. Apartment is close to old time, but from side where is park Emanuela Vidovića. Diocletian Place is just 10 minutes away. The local bus, train and boat station are 15 minutes by foot from the apartment. You will also have access to all beauty that Split offer. If you reserved Apartment Milisa contact us to make a deal where we will meet us for keys and chek in. Split is the second biggest city in Croatia and it is the industrial, business and university center in the region of Dalmatia. The city has 1700 years old history, and this ancient architecture can still be seen in Diocletian's palace, which represent the mere center of the city. We offer a taxi service from/to airport. Please contact us for info. Please contact us about your arrival time, that is very important for us. Please also inform us in the case that you change arrival time by mail or sms. We are here if you have any question. Do not hesitate to contact us. Check-in time is from 1 pm- 10pm (13:00h-22:00h) after 10 pm chek-in cost 10 euro! We also offer luggage storage. If you want to leave your luggage in our accommodation two hour after check in is free (till 1pm) after that it cost 20 kn per person. Its an actual home where theres a family living there, thats gives the place its amazing atmosphere and coziness! Guesthouse is in a great location a few minutes from the centre. We had a lovely room with a nice little balcony. Owners were very helpful and friendly. One slight issue for us is that there are only two bathrooms and sometimes we had to wait for a while to be able to use one. Overall we had a great stay and would definitely stay here again. Great experience! Pretty close to the second entrance of Plitvice Lakes National Park (about 25 minute walk). They let us check in early and were flexible with payment currencies. Also offered breakfast and laundry services. Overall happy with the stay and would recommend to others. Amazing stay, but location is not as listed. On arrival to what we thought was the guesthouse, we were driven to another location further out of town. The room was fantastic, comfortable bed/pillow, air conditioning (YAY) and plenty of storage space as well as a TV. There's also washing facilities which was super handy. Everything was clean and the kitchen was well equipped. Staff were extremely friendly, and also gave us a lift down to the port the next day after checkout. Great stay. arrived early due to overnight train and even though I had emailed and warned the hostel about this nobody was awake when we arrived and it seems we woke the whole place up by ringing the door bell. We dumped our bags and wandered around split for 5 hours until check in time and then we were put in another apartment altogether. The apartment was lovely and the woman who owned it (we presume) was also lovely. It was only a few minutes walk from the town which was very handy!